Last Sunday, I was fortunate enough to catch the special press screening of the much-awaited animated movie event of the year. The Ice Age 4: Continental Drift movie from Blue Sky Studios and 20th Century Fox brings fun and laughter to members of the family, friends, individuals, and press people who were there to witness the event. The movie press screening of Ice Age 4: Continental Drift gives lots of joys to kids and kids at heart alike as different mascot characters from the latest Ice Age movie glamorized the event. A specialized Ice Age photobooth, goody bags from McDonalds, Nestle Koko Krunch freebies, lollipops from Chupa Chups, car stickers from Caltex, and much more made the event extra special while kids from all age groups enjoyed watching the movie. Ice Age 4: Continental Drift is the fourth installment of one of the most successful animated movie franchises in the history of Hollywood. In this fourth installment, Manny, Diego, and Sid await new adventure at the high seas as the continent that they are living along with their family started to drift apart. Meanwhile, our most favorite little non-talking fellow, Scrat, continues to chase the acorn that he most wanted his whole life in search for the acorn "nirvana". In the tradition of Ice Age movie franchises, new set of characters are also included in this fourth installment. Sid's grandmother paid a visit to him, permanently, while a new set villains, lead by Captain Gutt, the ever-vicious primate pirate of the sea, make the lives of our awesome trio, miserable. All of these things are happening while the whole continent is drifting apart due to Scrat's little miscalculation accident of burying the acorn. I really like the fact the new Ice Age movie, Ice Age 4: Continental Drift did not settle for anything less comedy, fun, adventure, and moral values. Yes, there is a moral value even if I cared most about is Sid's funny as ever one liner and antics. Sid is so funny, he can be a stand-up comedian in the fifth installment! Yes! I am hoping for a fifth installment because Diego and Shira's love story has just only started. Well.. here's to only wishful thinking about the fifth installment. Hahaha. I never thought Ice Age 4: Continental Drift will ever lose its comedic performance, but no! The new Ice Age movie is as funny as the first three movie franchises or even better! The movie has a General Patronage rating, at least in the Philippines, so it is safe to watch it with the whole family! Although there are times that Captain Gutt becomes a little scary, Flynn, the English-accent dumb elephant seal, on the other hand, gives a relief to the whole pirate package! I so love his character and his looks! Hahaha! 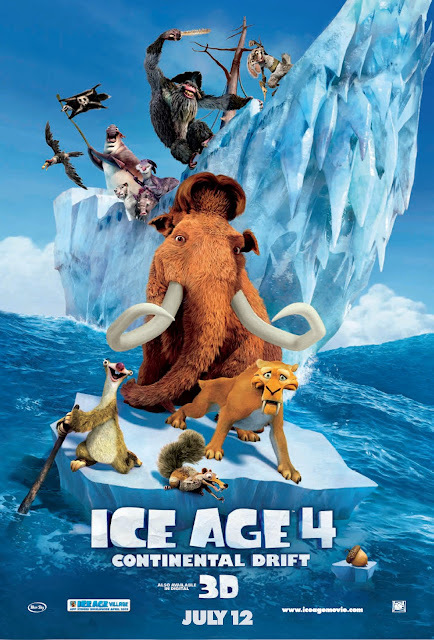 Overall, Ice Age 4: Continental Drift is the same old, brand new movie in a positive way. Same old funny as hell antics if not may even surpass the first three movies, same family bonding and friendship togetherness, but in a brand new adventure that sets sail to the high seas and to the drifting land. So, if you are looking for a good laugh, animated-adventure movie, Ice Age 4: Continental Drift is the only movie for you. Unless you are looking for some vampire hunting experience, well, that is another story you might want to consider. Ice Age 4: Continental Drift is showing on Thursday, July 12, 2012, in theaters, nationwide and worldwide (July 13, 2012). It will be available on 2D and 3D formats in select theaters. Below is the full movie trailer of Ice Age 4: Continental Drift. Enjoy and watch the movie with the whole family! • Ice Age 4: Continental Drift New Movie Trailer Finally Released! I'll probably put some car graphics just as like this one on my car. My son is really fan of the movie though, I think, the people who'll see my car will think that the design is a little bit weird and unusual.